However, there is a lot of hard work to get the cricket ground ready for the many matches ahead, starting on 6th/7th April with NatWest Cricket Force Weekend, when we hope to see many volunteers busy with all sorts of jobs. We then follow up taking a full part in the Frenchay Sport Family Open Day on Sunday 14th April. There will be taster cricket sessions from 11.00 through to 4.00, and we are also pleased to be hosting the fun run (reporting 10.00) organised by Frenchay Runners. The indoor season has finished now, with the older U12 ‘Blue’ girls winning the Gloucestershire Girls Indoor League with a full house 6 wins. As this is written, the U14 ‘Flames’ girls are leading the DFCA BYCL Indoor League with 6 from 7 wins in their debut season. They then faced the play off matches to decide the league winners. However, whether the ‘Flames’ carried on to win the league, they and the ‘Blues’ have enjoyed the experience of playing indoors, and definitely benefited from the challenges provided. Indoor net practice for all groups will be drawing to a close, and the youth teams will be starting training outdoors mostly on Friday evening just before Easter, with the seniors on Wednesday evenings. The Falcons Disability Cricket Group concentrating on providing opportunities for those with learning difficulties, will be starting outdoors every Monday evening (6.30 – 7.30) from 29th April. Well, the outdoor season is now fast approaching. All the senior teams and the many youth teams are studying their respective fixture lists, and the summer is certainly going to be a really busy time at the Bob Stone Ground. The three indoor league competitions have been progressing well. At Castle School, Thornbury, the older U12 girls, Blues, are currently unbeaten with two matches to play, while the younger, Reds, are gaining very useful experience as most of them can play in this competition for another two years. At the Brightside Ground, the U14 Flames girls are turning some heads with their performances, while the less experienced U12 boys are gaining valuable knowledge in a tough environment. In addition, the Falcons Disability Group continues to meet Sundays (1.00 – 2.00) at Shaftesbury Park. Off the field, the senior players are organising a Frenchay sponsored walk on Saturday 23rd March. Aimed at raising funds for the new pavilion, the walk will take in the Frome Valley and up around Duchess Park. The 'get the ground ready for the season' day (NatWest Cricket Force) will take place on Saturday 6th April. Although we are several months away from the start of the outdoor season, there is lots going on with cricket. The ground is looking good, thanks to the hard work and commitment of the many volunteer grounds team. The new drainage system is paying dividends, with the surface firmer than it has ever been even after a great deal of rain. Looking towards the new season, the seniors are involved in winter training every Thursday evening (8.30 – 9.30) at the Sports Hall, Winterbourne Academy through until mid April. Contact: frenchaycricketclub@gmail.com. The various youth teams are also starting Indoor training soon, details from frenchayyouth@gmail.com. At the same time, all of our 27 young players involved in Gloucestershire Winter County Age Group Squads are now busily engaged with their individual challenges. There is also indoor match activity going on, with the U12 Girls (x2), the U12 Boys and the U14 Girls teams all being involved in the excitement of indoor leagues. The U12 Girls have two teams involved in the Glos Girls League at Castle School, on Sunday afternoons for the first time, showing the increasing strength in depth. They are playing six matches against other girls teams from across Gloucestershire. The Blues are the older, generally more experienced team and the Reds are the younger squad. At the same time, the U12 Boys and the U14 Flames Girls are taking part in the BYCL/DFCA Indoor League at the Brightside Ground on a Saturday afternoon, involving eight teams over three months. Both competitions are good fun and really helpful experience looking ahead towards the approaching season. A very happy, peaceful and prosperous New Year to all readers of Frenchay News. We are looking forward to a really busy year ahead at the Bob Stone Ground, and there is lots of news and activities to report. Pride of place goes to Natasha Wraith (pictured below), who has been named as a member of the ‘Winter Training Group’ attached to the England Women’s National Cricket Academy. This is a wonderful achievement, and recognition of the progress, ability and commitment of this 17 year old wicketkeeper/batsman, formerly of Winterbourne Academy, now a student at SGS College. Nat joined Frenchay girls as an 8 year old, and since then has consistently stretched (and peppered!) the boundaries with her progress through the Frenchay teams and Gloucestershire County Age Group sides. More recently she was a member of Western Storm Development. She has been Gloucestershire Senior Women’s wicketkeeper for the past two seasons. We look forward to seeing Nat meet the challenges that this level of cricket will provide. Looking towards the new season, the seniors begin winter training every Thursday evening (8.30 – 9.30) at the Sports Hall, Winterbourne Academy, Flaxpits Lane, Winterbourne , starting on 17th January through until April. Contact: frenchaycricketclub@gmail.com. The various youth teams are starting Indoor training soon, details from frenchayyouth@gmail.com. At the same time, all of our 27 young players involved in Gloucestershire Winter County Age Group Squads will also be setting off on their individual challenges. There is also ‘Indoor Match’ activity coming up, with the U12 Girls (x2), the U12 Boys and the U14 Girls teams all being involved in the excitement of indoor leagues over the next few months, with the ‘12s’ and separately the latter two each facing one another! Members of the Cricket Club wish all readers of Frenchay News, a very Happy Christmas, and a peaceful and prosperous New Year. It is difficult to believe that we are approaching 2019 already! It seems like the cricket season only finished a few weeks ago, and yet, when the days start to draw out in the New Year, the new season is soon upon us. Following on from the various awards mentioned in the two recent editions, another batch came the way of the club more recently at the Gloucestershire Women and Girls celebration evening at the Brightside Ground. The Under 13 ‘Heat’ Girls picked up the U13 South League title, while the U15 ‘Flames’ Girls achieved a clean sweep at their age group, winning both the Indoor Blast and the Outdoor Blast Competitions. Pictured below is the successful Outdoor Blast Flames Squad, which includes six girls who started their cricket some years ago at our linked local primary schools. The squad is flanked in the photograph by Western Storm players Sophie Luff (left) and Fran Wilson, who is an England International. The Under 12 Boys have been gaining valuable experience taking part in the very competitive Indoor League on Saturdays at the Brightside Ground, and the U12 Girls will be preparing for their Indoor League competition which starts in January. Indoor practice sessions for the seniors and various youth squads will be starting in January/February, and details can be obtained through the contacts above. A host of presentation events have taken place starting with the Annual Club Dinner held at the Kendleshire Golf Club. The ‘Cricketer of the Year’ went to Ben Stoddart, who also picked up the ‘Hickers’ Players Player' Award. Sonny Reynolds was named ‘Young Cricketer of the Year’, and the ‘Christine and Ian Golding Merit’ Award went to Sally Woodsford. Tom Bibby and Ben Stoddart shared the ‘Phil Pascall Performance of the Year’ Award for 129 not out and 7 for 28 respectively. Max Evans won the 2nd Xl Player of the Year, and young Danny Thorne was awarded 3rd Xl Player of the Year. Tom Bibby and Dave Busby collected Tankards for scoring centuries. At the recent Gloucestershire Cricket Board County Performance Awards, Izzy Carey received the U15 Performance of the Year. Izzy Patel received the U13 Player of the Year, and Ellie Donaldson the U11 Performance of the Year. During recent Youth Presentation evenings at the club, Izzy Patel was named ‘Junior Player of the Year’, and Amy Patterson received the ‘Junior Clubperson Award’. The 1st Xl concluded their super season, successfully winning their last match (pictured below), to become Bristol and District League Champions for 2018. Winning 13 out of 18 matches played, the team is promoted back into the West of England Premier League, where we will renew the exciting prospect of the ‘local Derbies’ with Stapleton. At the same time, the 2nd Xl secured their place in Division 4 with a solid performance in their final match. Unfortunately the 3rd Xl didn’t fare so well, and have finished at the foot of their Division, but nevertheless have seen a number of young players ‘blooded’ into Senior cricket across the season. After the excellent, hot summer, and the recent rain, the drainage improvement works are beginning to settle down with the new grass growing well. The past season was always going to be a challenge with the extent of the groundworks involved. And so it proved, more so with the wettest spring in 30 years followed by the driest summer for 40 years! But now there are great signs that the scheme will provide immense improvements to the quality of the playing area for sports in the years ahead. Do you know of any disabled teenagers who might benefit from the opportunity to get involved in sport locally? Frenchay Falcons are starting a ten week programme of cricket for disabled teenagers on Sunday 7th October in the Sports Hall at the Dings RFC Shaftesbury Park Ground, Frenchay Park Road. Well, the sunny, hot weather continued through August, and what a welcome impact on the cricket season! More matches played, more people smiling, more activities on the field and in the clubhouse. Fingers crossed that these conditions continue until September. On the field, the 1st Xl have continued their good run, currently leading the Bristol and District Senior Division, having put in some really good performances against competent opponents. There are still a number of matches to go before the season concludes, and everyone will need to continue to be up for the challenge to maintain the momentum. The 2nd Xl have continued their ‘in and out’ season, including an exciting tie, while the 3rd Xl have given more young players their on-going development opportunities. At youth level, Frenchay ‘Heat’ U13 Girls, pictured below, made history by winning the Dave McCarthy U11 KO Cup, defeating Bristol YMCA at Frampton Cotterell. They are the first girls team to win a DFCA Bristol Youth League competition in the 47 year history of the league. On the day, the side included six girls who have come through our highly successful ChanceToShine coaching programme, which is run annually in local primary schools. The ‘Heat’ then went on to win their league section, but lost out in the championship semi final to a very competent Winterbourne side. In early August, around 75 youth members from the U9s to the U17s took part in the highly successful youth day, where the age groups are mixed up, and a six a side competition takes place, finishing in a final, this year won by the ‘Sri Lankan’ Team. The weather was super, and there were lots of smiles and good entertainment through the day. Well, the weather could not have been more positive towards playing matches these past weeks. Unrelenting sun has produced lots of cricket and people have generally seemed very content, being outside, having a quiet drink, seeking the cool of the Clubhouse for some respite, and generally enjoying the time. On the pitch, the 1st Xl didn’t perform as expected, losing the B&D KO Cup Semi Final by a very narrow margin. However, they currently top the senior division with 10 matches played. Still a long way to go, and with a chasing posse of clubs, a lot of work to put in. The 2nd Xl have continued their mixed season, and the 3rd Xl, often with a number of young players, have recorded their first success. At youth level, all the Tteams are competing well with mixed success. As this is written, the U11 Boys are approaching a cup semi final, the U13 ‘Heat’ girls have reached the final of the Dave McCarthy KO cup, and the U15 boys are challenging for their section lead. On the wider field, a lot of the youth players have distinguished themselves representing Gloucestershire at various age groups this season. Pride of place however should go to the six older Frenchay girls who have now played for the Glos senior wmen’s team. Off the field, the drainage contractors have returned during the extremely dry weather, to reinstate the levels of the ‘criss-cross’ drainage trenches on the main pitch outfield. This was work that had to be postponed because of the extremely wet conditions in the spring. How times have changed! Well, the sun has been shining intermittently and the weather has been fairly good for cricket so far. Up to the moment, the 1st Xl have secured some good wins in the league and progressed in the Knock Out Cup competition. The 2nd Xl have had a mixed season so far, and the 3rd Xl have now achieved their first win, with some very promising performances from the younger players. At youth level, the children taking part in All Stars on a Sunday morning make it a really busy and noisy place. The under 9s are progressing well and will improve further now that Keanan Mitchell is here to support their on-going development. Keanen is over with us for the season from Cape Town, South Africa, playing cricket and getting involved in aspects of the coaching and development of our young players. Beyond the U9s, all the youth teams are performing well and the young players are gaining experience as the season progresses. It is also good to mention that more volunteers have come forward to support the coaching of the many groups involved at the club. This is so important to secure a sustainable future. Off the pitch, the volunteer groundstaff have been busy as usual keeping the ground spick and span for the teams. A group of people are also busy putting together our application to renew our ECB clubmark accreditation. This is a really important focus of recognising the wider role of the club, how it is performing, and how we particularly look after the young people involved with cricket at the Bob Stone Ground. who was made a BEM in the Queen’s birthday honours list for his services to youth cricket. The season is now well under way, with the senior teams moving forward involving plenty of young players who have come up through the youth system. The youth teams have also played quite a few matches and the Play Cricket website has all the fixtures and results. Coaching through the ChanceToShine Programme has been taking place on Frenchay Common on Wednesday afternoons with Frenchay Primary School. The coach is a young player, Claudia Dark, who came up through the Frenchay youth system, and she is being aided with the after school club by ex-Student Georgie Hunt, first girl from the school to play cricket for Gloucestershire and who recently toured Sri Lanka. Four Frenchay girls (aged 16 & 17) have recently made their debut for the Gloucestershire County Women’s Senior Team in the National County Competitions. The All Stars programme for 5 year olds is busy on a Sunday morning at the club, and we look forward to these youngsters making progress up through the age groups. This is an excellent initiative spearheaded by the ECB, and it will be leading to changes in the formats for cricket provided for 8 – 11 year olds in 2019. The idea being to engage more young people more actively in each match by reducing the numbers of players involved, getting those playing doing more, and reducing the length of the pitches used. Bringing forward changes in the established local formats for these age groups will no doubt‘ruffle a few feather’ along the way, but the logic of ‘more players, playing more cricket, more often’ is difficult to challenge. As I am writing this it is wet, so we are hoping that the weather pattern will have changed now we are into the new season. The league season for the senior teams will shortly start, so we are looking to build on last year. The youth teams, having had a series of sessions indoors, started outside back in April and the vibrant Friday youth nights have so far been buzzing with activity, chatter and laughter. All visitors are now potentially more comfortable, with the improved toilet facilities in place following the ECB small grant. The poor weather prevented the drainage contractors from undertaking the final reinstatement works on the improved outfield, so that is postponed until September. While this is a disappointment for surface conditions, there was always this risk depending entirely on the weather, but the improved drainage is working well, and this was always a longer term improvement project. The club is very pleased that courtesy of grants for initiatives generously supported by Trevor Jones and Bob Pullin, our South Gloucestershire Councillors, a new drag mat for use by the groundstaff, a ‘throw down net’ used for training, and coaching courses for adults and youth players have been agreed. In addition, two new sightscreens have arrived for the top pitch, courtesy of a S106 Grant from South Gloucestershire Council. The club and D&F Tennis Club have also combined to install new lighting on the driveway to the clubhouse, which is a major improvement for all users. All Stars Cricket for younger children - coming to Frenchay on a Sunday morning later in May, an ECB initiative aimed at introducing 5 – 8 yr olds to cricket. More information from https://www.ecb.co.uk/play/all-stars. Frenchay Falcons for those with learning difficulties continues on a Monday evening outdoors and now with indoor table cricket. The outdoor season will be starting quite soon with youth matches scheduled later in the month and senior friendlies. The contractors are due back around now to assess the impact of the drainage improvement works, and particularly to look at the finished grass surfaces to see if any further reinstatement is required where so many trenches were created to establish the better drainage. Excellent news just through that the club has been successful in receiving an English Cricket Board (ECB) small grant. This is going to be used to upgrade the ladies and gents toilets in the clubhouse, noting that all the improved facilities to be provided are designed to be transferable to the new pavilion when that is constructed. The improvements will also include some new benches for the ground, and is based on improving family friendly facilities as part of the ECB's All Stars programme. The six girls plus parent supporters from Frenchay who toured Sri Lanka with Gloucestershire U17 Girls in February had a wonderful time (in the sun!!). What a truly marvellous experience. The outstanding story in amongst this is that two of the girls are direct products of our coaching work through the Chance To Shine campaign in local primary schools. Six years ago, two nine year olds, Georgie Hunt at Frenchay C of E Primary and Molly Bliss at Bromley Heath Juniors, enjoyed the opportunity to get involved in cricket at school. They joined Frenchay, progressed through Frenchay and Gloucestershire age groups, and have both now also played senior cricket at the club. Who would have believed six years ago that they would be travelling 5000 miles to play cricket? The evenings are drawing out and the cricket season approaches. Looking ahead, NatWest Cricket Force weekend takes place over 7th - 8th April. This ECB nationally promoted event, is when members prepare the club for the upcoming season. There are inside jobs: cleaning, tidying the dressing rooms, painting and outside ones: re-erecting the netting on the outdoor nets; getting the benches and picnic tables out;varnishing them and putting them around the ground; grass cutting; hedge trimming; sorting out coaching equipment for the various youth teams. A very necessary time taken to get the club ready. The Club is extremely pleased to announce that the Frenchay Falcons Ability Cricket Group has received a grant from The Friends of Stoke Park Hospital Fund, which will enable us to continue our programme on Monday evenings during the summer working with those with learning difficulties. We are very grateful for this generous support, and anyone interested in being involved with the Falcons can contact Jim Donaldson (07771502274) for more information. We are also continuing to develop our preferred scheme with our retained architect for a new pavilion at the Bob Stone Ground. We have had several meetings aimed at refining the design and accommodation, so that we can promote a building that matches the needs of the club with the wider community. As the evenings begin to draw out, it means that the outdoor cricket season is not too far away. All the senior fixtures have been published and the various youth fixtures are being sorted as this article goes to press. Meantime, the U13 Boys are involved in the DFCA BYCL Indoor League at the Brightside Ground on Saturday afternoons and the U12 Girls with the Glos Girls Indoor League at Castle School, Thornbury on Sunday afternoons. While all of our 27 young players involved in the Gloucestershire County winter training programmes are keeping busy at their respective weekly sessions, six of them (and some lucky family members accompanying them) are looking forward to jetting off to warmer climes very soon now. Maisie Hunkin, Ellen Harris, Maddie Hughes, Helen Cutler, Molly Bliss and Georgie Hunt (a product of Frenchay Primary School) are off for ten days in Sri Lanka as part of the Gloucestershire U17 Girls Squad. What a wonderful development experience for the young players, getting the opportunity to play against strong teams on a couple of grounds used for international test matches. As part of the build-up, the girls were recently interviewed by Geoff Twentyman for his Radio Bristol Sports Store programme. Who would have thought that when they both took up the opportunity to have a go playing cricket when the Frenchay Coach ran some sessions through our ChanceToShine Programme at their respective primary shools six years ago, that Georgie and Molly would be flying 3,000 miles to play cricket in the sun? You never know where things can lead (with a lot of commitment and support)! A very happy new year to the whole Frenchay Community. While we may be well outside the summer season, the cricket club has still been a busy place with work continuing maintaining equipment and the grass surfaces. The Under 12 Boys completed a successful run in the DFCA Indoor League played at the Brightside (County) Ground. The U12 Girls Squad has also held some practice sessions prior to their taking part in the Glos Girls Indoor League Competition, played over Sunday afternoons in January and February at Castle School, Thornbury. Both of these competitions are good fun, and are also really excellent experience for the continuing development of the many young players who take part. Youth training winter nets for the youth squads for U11s through to U15s, and U17 Girls will also be starting in January on various evenings at venues in the local area. It's great to be able to tell you that the major drainage improvements are now complete, and Frenchay Forestry have kindly assisted in the new fencing to improve the Filton Road frontage. The well attended annual club dinner saw a number of awards handed out. Top of the list, Mike Donaldson, standing down after 21 years as 1st Xl Captain, received the Cricketer of the Year award, shared the Phil Pascall Performance for his 186 not out at Bristol West Indians with Eddie Wiilliams ( 9 – 9 v Downend 2nds), and was made a life Member. Chare Smith received Young Player, Elliott Gibbons (2nd Xl Player), Randall Taylor (3rd Xl), Will Stabb (Sunday Xl), and Tom Bibby the prestigious John Hickman Players Player award. Pauline Brumpton picked up the Golding Award, and Ian (George) Golding the Clubman of the Year. Celebrations for the club were the order of the evening during the Gloucestershire Clubs Womens and Girls Presentation event at the Brightside ground. Frenchay picked up awards for winning the U12 Girls Indoor League, the U13 (South) League and Lady Taverners, the U15 Indoor League and the U15 Girls Blast Trophies. In addition, Sarah Walsh and Georgie Hunt received the Individual Batting awards at U13 and U15 respectively. Youth awards presentations took place over two evenings in September. The main awards went to Joe Moss (Youth Player of the Year) for his overall performances, and Georgie Hunt (Youth Clubman of the Year) for her work assisting with the coaching at Frenchay School. A host of young players were rewarded for their hard work over the season. It is particularly pleasing that nine of the award winners have come through from our ChanceToShine coaching links with the local primary schools. Notable successes were U11 Boys - KO Cup Semi Finalists, U11 Girls - Lady Taverners County Runners Up, U12 Girls - Glos Indoor Champions, U13 Girls won the Glos Girls South League and the County Lady Taverners Competition. The U15 Flames Girls are the inaugural Glos Girls Blast champions. More achievements have also been recognised for our young players at the recent Gloucestershire County Age Group Awards evening at the Brightside (County) Ground. Centre stage went to Natasha Wraith, who was named Player of the Year for both the U15 and U17 County Girls. Sarah Walsh was rewarded for her hard work by being given the U13 Performance of the Year award, for her innings of 41 to secure a win in the county match against Wales at Colstons School in May. Focus now turns to indoors and the Frenchay Wonder Womens team will be taking part in the first Gloucestershire Womens Softball Festival at Wycliffe College during this month. Details of the indoor winter training programme for seniors and youth groups will be announced in the December Frenchay News. At the ground, work is progressing well with the drainage improvements for the main pitch, courtesy of the generous grants from Sport England and South Gloucestershire Council. The season just gone may not have been spectacularly hot, but for the second time in three years, the 1st Xl played every one of the 18 scheduled league matches. Sadly, they fell just short of achieving promotion back to the West of England Premier League. Nevertheless with a considerable number of players new to the Club, this season is seen as a success. Notable amongst that, Char Smith was Senior Division leading wicket taker, with ‘Aussie’ Bryan Lutter 3rd and Eddie Williams 5th. Mike Donaldson was 2nd in the batting averages with the highest individual score (186 not out), and Tom Bibby finished as leading wicketkeeper across the entire league with 27 victims. The 2nd Xl finished a very creditable 4th with their mix of youth and experience, and the 3rd Xl completed their programme, sometimes with a struggle, but with invaluable experience for many young players. Another notable achievement was 15 yr old Natasha Wraith establishing herself as the no. 1 wicketkeeper for the Gloucestershire County Senior Womens Team, with 16 yr old Naima Milhofer making her senior county debut, and 15 yr old Maisie Hunkin called up as 12th man. These plus the many girls and boys who are currently going through county trials, shows the strength in depth of our youth system through the age groups. One of the outstanding successes has been the establishment of the Frenchay Womens Social Cricket Team, pictured at the county ground. Throughout the summer, the group has met on a Monday evening, and amidst lots of laughter, they have had real fun getting into cricket, learning the skill of overarm bowling’. They have taken part in several festivals against similar teams of women, including at the county (Brightside) ground, and few can say ‘we have played cricket on the county ground’. Another cricket season is drawing to a close and on the field, the 1st Xl continue on their good run, and need to maintain this to the end of the league season in early September. The 2nd & 3rd Xl’s have enjoyed modest success this term, with lots of the youth players involved. The U13 Foxes girls won their section, but lost their league semi final in creditable fashion to a very competent Winterbourne side. With nine of the eleven players available at this age group next year, the prospects are really good. The U15 Flames girls took part in the inaugural Gloucestershire Clubs U15 Girls Blast tournament. Having overcome Bath in the qualifying rounds, the finals were hosted at Frenchay. Wins over Dumbleton, Charlton Kings and Corse & Staunton saw the Flames become the first holders of the Blast Trophy. While the whole squad performed well, the stand out performance was by George Hunt (a product of Frenchay School) who retired 35 not out in each match. On 6th August, around 60 young players took part in the very successful youth day, when the age groups were mixed up in a six a side competition. Off the field, the contractors start the major drainage improvement works on the main pitch, with work to provide the underground tank and pump beng the first phase. Once the season finishes in early September, work then starts to provide the series of parallel trenches with porous pipes and gravel. Hopefully good weather will allow completion and reinstatement of the outfield by early autumn, giving maximum recovery time prior to the 2018 season. The club is very grateful for the support of Sport England and South Gloucestershire Council in helping to achieve this massive and very welcome improvement of our facility. The weather so far (which will hopefully continue through the season) has been very helpful for cricket. The 1st Xl are continuing a good run, the 2nd Xl having a good season, and the 3rd Xl doing well with the resources. In the youth teams, the U11 girls finished as runners up and the U13s as winners in their respective Lady Taveners County tournaments. All the sides have had good experiences as the season begins to draw to a close and some are in contention for further honours. Off the field, Friday youth night continues to be as popular as ever with the place heaving with young people and families enjoying the chance to chat and relax. 30 of the younger players had a fabulous time on 9th July, having had the privilege of being invited by the ECB to take part in the opening ceremony of the Womens World Cup match between England and Australia at the Brightside (county) ground, Bristol. More than 100 members of the club attended what turned out to be a nail biting win for England and the youngsters were also given the opportunity of playing on the hallowed turf during the luncheon interval and obtaining masses of autographs. What an experience! On the same day, Frenchay itself was incredibly busy, hosting 12 under 9 teams in a tournament. Cricket coaching at Frenchay Primary school has been completed, with house matches, concluding the year 5 & 6 sessions and a shorter series of sessions for the years 2 & 3. We are well into the season now and all the senior teams seem to have started well, although there is a long way to go and no doubt a few twists and turns to experience. So far there have been some impressive individual performances, led by Eddie Williams taking nine wickets for nine runs against Downend 2nds, Mike Donaldson hitting 186 not out against Bristol West Indians and Phoenix, and Natasha Wraith scoring a century against Wales in a U15 ECB League County match. It is great to see the new bowling machine, the mobile batting net and the wooden pole batting net system getting plenty of use by seniors and youth teams alike. These have been provided following the receipt of grant funding through the S106 process from South Gloucestershire Council. Off the field, there is good progress with the scheme to improve the drainage of the main pitch. Tenders have been submitted and a contractor appointed with the agreement of Sport England. Work is set to start on the installation of the attenuation tank and pumps before the end of the season. This will then allow for the completion of the playing season, before work commences in early September on the construction of the system of trenches across the areas of the outfield most susceptible to waterlogging. Achieving this timetable is important to secure completion in the early autumn to allow surface reinstatement and maximum recovery time before the start of the 2018 season. Sunday 16th July (all day) – U15 Glos Club Girls Bash County Finals – Four U15 Girls teams playing a round-robin tournament to decide the U15 Glos champions. The first Frenchay Sport Family Open Day held on Saturday 22nd April seemed to go well. The six clubs involved (Frenchay Runners, Dings Crusaders RFC, Frenchay Tennis Club, Downend and Frenchay Tennis Club, Bristol Golf Centre, and the Cricket Club) all reported lots of interest. The day started with local MP, Jack Lopresti formally opening the event, supported by Cllr Trevor Jones, who provided funding support for publicity through his ‘Member Awarded Fund’. A ‘Family 2K Run’ organised around the edge of the cricket ground, took place in the morning, and it proved very popular for the young, the very young, and the slightly older. Dings provided the chance of touch rugby, lots took advantage to try tennis and cricket, and a number of people took the opportunity to try out the golf range. The clubs have already decided to make this an annual event, and have already met to start arrangements for 2018. Thank you to the Frenchay News team for your cooperation in helping to promote this new event in the community. Lots of cricket has now taken place, with the senior teams starting positively, and all of the youth sides making best use of some good weather to get lots of matches played. News has also come through that 24 of our youth players (5 boys and 19 Girls) have been selected to take part at county level for Gloucestershire (6 Frenchay girls represented Gloucestershire in a recent under 15 win over arch rivals Somerset!). The Falcons Ability Cricket groups are running on a Monday evening, and we ran a very successful SEN Schools Day in early May. All Stars Cricket for 6-7 yr olds has started on a Sunday morning, and not to be outdone, a Social Womens Cricket Group is running on Monday evenings. The new Season is under way, with the first senior league matches due on Saturday 6th May: the 1st Xl playing at home to Portishead; the 2nds away to Bristol YMCA 2nds; the 3rds away to Old Down 2nd Xl. Lots of the youth teams have also had league and KO Cup action already and Friday evening youth nights at the club have been ‘buzzing’! For those with learning difficulties, meeting at the ground every Monday evening starting on Monday 8th May. The two groups are ‘11 – 16 yrs’ at 6.15 – 7.15, and ‘16+’ at 7.15 – 8.15, led by experienced Coaches. Anyone interested contact: bycl@blueyonder.co.uk . A really big ‘Thank You’ to our two local councillors: Trevor Jones for agreeing to fund the publicity element of the recent Frenchay Sport Family Open Day held on 22nd April (Report in June edition); Bob Pullin for supporting alterations in the clubhouse to provide a female changing area’ (when required) for our girls/women playing in senior cricket matches. The new outdoor season is almost here, and (as I write this) hopefully the weather has been considerably drier through March for the ground to recover. The long awaited drainage improvements to the main pitch area of the ground cannot come soon enough! The club is delighted to be jointly hosting the first Frenchay Family Sport Open Day on Saturday 22nd April. Full details appear on the central pages of Frenchay Community News. It’s great that six local Sports Clubs: Frenchay Tennis, Downend and Frenchay Tennis, Frenchay Runners, Bristol Golf Range, Dings Crusaders RFC (coming to Shaftesbury Park in Frenchay Park Road in October) and ourselves are getting together to promote sport in the community. The completed indoor league season had mixed fortunes for Frenchay sides involved. The seniors finished third in their league, while the U13 B’s struggled manfully against very competitive opposition, but will have learned along the way. However we are delighted that the U12 Girls (including locals Rachel le Poidevin, Evie Patterson, Ester Green and Becca Whone) finished unbeaten as Gloucestershire champions, and the U15’s (including locals Mia Balkwill and Amy Patterson) followed this by winning the Gloucestershire tournament. Coming to Frenchay on Sunday 30th April, a new ECB initiative aimed at introducing 5– 8 yr olds to Cricket. The four senior teams and nine youth teams are set for busy times. The grounds team have been busy, with a main portion of the hedge to Filton Road trimmed, and further painting inside and out. Looking ahead, we will be holding the NatWest Cricket Force Weekend on Saturday/Sunday 1st/2nd April, with lots of volunteers getting the ground ready for the season ahead. The drainage improvement scheme for the main pitch area has moved forward with a formal offer from Sport England, and we now await detailed estimates from specialist contractors. The intention is to start the works towards the end of August, so that as much restoration as possible is achieved prior to the start of the 2018 season. Seniors - Tuesdays 9.00 – 10.00 at Fairfield High Schoo. Contact frenchaycricketclub@gmail.com. Youth teams spread across the week at different venues continuing through March. Our two younger teams taking part in the indoor leagues are experiencing mixed fortunes. The U13 ‘B’s are generally struggling against stronger, more experienced opponents, and the U12 girls with lots of players keen to play, are currently faring better against their Gloucestershire based counterparts. We can now expand on the 22 young players reported in January, as joining the various county winter training programme. Congratulations to Natasha Wraith (U15), who, as well as joining the Western Storm Development Squad, is the sole girl of just five young players from the whole of the county in the Gloucestershire Emerging Players Programme (EPP). We can also congratulate Naima Milhofer (U17) and (for the first time) Lily Knox (U13), both in the Gloucestershire Girls EPP and Maisie Hunkin (U15) in the girls Sub EPP programme. The weather conditions at this time of the year mean that outside work preparing the ground for the coming season is very limited. Nevertheless, the ground team have been as occupied as they can be, and the paint brush/roller and emulsion have been very busy giving the inside of the clubhouse a very welcome freshen up. The detailed report on drainage improvements has been received from the geotechnical consultants, and this provides three alternative ways of improving the drainage of the main pitch. The extent of the work that will ultimately be involved will be dependent on the comparative costs vs budget from Sport England, and we are in discussion with them to finalise the details and programme. Whichever option is chosen, it will produce a better drained pitch, which will result in more matches being played, and just as important, allow better, fuller use of the ground. Frenchay Sport Open Day is coming in April. More details in March. In the indoor leagues in the autumn, with the final to go, Frenchay seniors are in a good position to win the very first DFCA Adult Sevens indoor league title. The fairly inexperienced U12’s have found it tougher against generally more experienced opposition, but nevertheless came away with credit for their performances and commitment. Looking ahead, our two girls squads (U12’s and U15’s) start their respective Glos Clubs indoor competitions at Castle School, Thornbury against other similar girls teams in early January. Fairly quiet time at the club for the next few weeks, but far from that for lots of the players and coaches. For the club teams, indoor practice net’ sessions for all the senior teams start weekly on Tuesday 17th January in the sports hall at Fairfield High School, Horfield (9.00 – 10.00 pm). Anyone interested, please contact Mike Donaldson (07470486017 or mike.donaldson@blueyonder.co.uk). Indoor practice net sessions for youth squads start at several different venues in February, details next month. In addition, 22 of our young players are now embarking, some for the first time, in the concentrated winter training programmes of various Gloucestershire County performance squads. These young players will be looking to make their mark with the respective coaching teams, working hard to hopefully secure a place in the summer playing squads. Looking a little ahead, the club will soon be finalising details of the Chance To Shine cricket coaching programmes at Frenchay School and four other local schools, and we hope these will be good for the children, the schools and the club. And there is no doubt, with the numbers who have already progressed further, it’s also good for the wider sport. The strength of the youth programme at Frenchay has been underlined with the recent announcement of the 2017 Gloucestershire County winter training age group squads, where 5 boys and 17 girls from the club are included. Local youngsters Georgie Hunt and Amy Patterson (U15’s) and Evie Patterson (U11’s) feature in the highest numbers ever recorded for the club. On top of this, Natasha Wraith has been invited to join the Western Storm (ECB Regional) Development Squad, which is a serious reflection of her commitment and potential. A very happy Christmas, and a peaceful and prosperous New Year to everyone. Late September saw two really busy youth presentation evenings at the club. ‘Standing room only’ on both evenings tells the tale of a flourishing youth system, as the players and parents/relatives met for the last time before the winter break (for most anyway!). The Senior Awards took place at a very lively Annual Presentation Dinner held at Cleve Rugby Club. How quickly the season has gone. No sooner looking forward to getting the first matches played, than working on putting the ground to bed for the winter! On the field, sadly the season went from bad to worse for the 1st Xl, who after some average performances, were left to frustratingly watch the rain fall on the last day of the season when we needed to play and win, resulting in relegation by just two points. The 2nd Xl finished a creditable fifth in their division, while the 3rd Xl were also relegated, having in reality been placed in too high a division in the restructuring. ‘Rebuild and reinvigorate for 2017’ is now the message, no crying over spilt milk. Off the field, the groundstaff and volunteers were really busy in September, carrying out the very necessary work scarifying the surfaces, laying loam and re-seeding, preparing the two squares for next year. The receipt of the detailed report from the geotechnical consultants on the drainage improvements has been delayed, so we do not know as yet what the detailed recommendations are, the costs involved, or how and when the work will take place. Details of the youth and senior presentation evenings will be published next month. Meanwhile, while the outdoor season has finished, two indoor leagues operated by DFCA Coaching are now starting at the Brightside (County) Ground. The U13 Boys will be involved with a league including seven other teams, and the seniors are involved in a new venture for players from U14 upwards. Another season draws quickly to a close. 'Where did it go?' seem to be the words on the lips of everyone I speak to! Fortunes on the pitch have been mixed for all the senior sides, but there have been lots of the younger players being given (and taking) the opportunity to play a more challenging form of cricket. At youth level, the U17’s had a good season, reaching the KO Cup Semi Finals, and being pipped on the post in the league. Up through the age groups, each team performed well, and we have to thank the volunteers who led and coached the teams up to and throughout the season. Off the field, we still await the consultants report and recommendations for the drainage improvements at the ground. A soggy outfield has again been responsible for cancelled and abandoned matches, so we must find a solution. The drawings showing the preferred design for our new clubhouse were published at the ECB Club Open Day sponsored by Waitrose, held in August jointly with the Downend and Frenchay Tennis Club. The scheme reflects the multi-sport status of the ground by providing six changing rooms, designed to accommodate tennis as well as cricket. This also reflects the mixed teams that Frenchay is now proud to have, with our increasing number of girls/women playing at senior and youth levels. It also looks ahead to the situation when over 3000 new homes are in place within one mile of the ground. The social area can be sub-divided, so that two separate events can take place, providing a healthier and more sustainable future. September will see the grounds team plus others, working hard on the two squares, to ensure that the wickets provided in 2017 are up the usual good standard. Writing this article, we are now half way through a busy season and the weather has been changeable, a typical English summer really! On the field, the fortunes of the senior teams has been mixed, with some resounding wins seemingly followed by some not so creditable defeats. The ‘youth production line’ continues unabated: with two U17’s (Louie Hunkin and Reece Bevan) establishing themselves in the 1st Xl with some very creditable performances; young Natasha Wraith making her wicketkeeping debut in the 2nd Xl; Natasha and Naima Milhofer securing regular places in the 3rd Xl; young Amy Patterson also making her debut in the 3rd Xl. Off the field, two exciting projects are coming closer. Firstly, we are now awaiting the report and recommendations from the engineers appointed by Sport England to look at drainage improvements at the ground. Underlying Frenchay clay has long been a problem in times of continuing wet weather, and we expect the proposals coming forward to help to make the current waterlogging less significant. The soggy outfield alone has already cost us two cancelled/abandoned matches this season. Secondly, locally based architects Bush Consultancy, have been working with us to produce a scheme for a new clubhouse at the ground. Our current building is no longer fit for purpose, and we must look to replace it with a facility that befits our multi sport ground. We have to be looking ahead positively with so many new houses set to be constructed in the surrounding area in the coming years. Further details will be announced shortly. The season is now well under way with the weather mixed and most matches played. The 1st Xl started with a resounding win at Twyford House, supported by the 2nds victory over Congresbury. The mood is much more positive this season, with travel far more localised for all the sides. Frenchay ChanceToShine, the Scheme taking Cricket into local Schools, is now leading the way as the first project in Gloucestershire to be supported by sponsorship. The partnership with Elite Tyres and Autocare of Yate and Thornbury was formally launched by Fran Wilson, a member of the England Women's International Squad and an ECB Coaching Ambassador on Frenchay Common on 17th May. Fran then had the rest of the morning coaching and talking with the children at Frenchay School, before moving on to Bromley Heath Juniors. The support from Elite will enable the Club to promote more cricket in local Schools, particularly focusing on the younger age groups at Frenchay School, as well as supporting the girls at Winterbourne International Academy. Later in the day, a team of girls from Frenchay School took part in a ‘Kwik Cricket Festival’ involving four other primary schools at Bromley Heath. 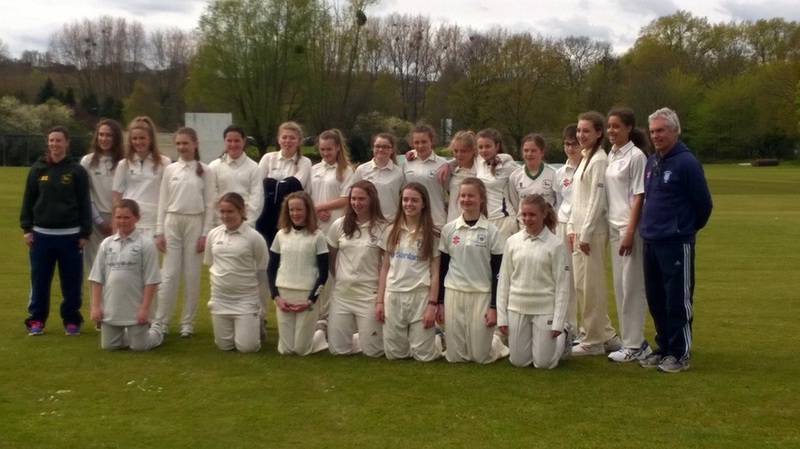 Frenchay Girls were also involved in a little piece of history, when the U15 ‘Frenchay Flames’ took on the ‘Brislington Vipers’ at Ironmould Lane, in the first ever all girls match in the 55 years of the Bristol Youth Cricket League (pictured). The other very significant news is that the club has teamed up with local architects, Bush Consultancy, on the development of a new pavilion, to replace our aging structure. This is a crucially important project to provide a more sustainable club into the 21st century, More news will follow as the project moves forward. After a wet winter, the ground is now really in need of dry, windy weather because if the water table stays high, the surface remains susceptible to getting boggy even after modest rain. The club is however positive about radically improving the historic drainage challenge if we can secure the Sport England grant. The indoor season has now been completed, the U12 Girls finishing a very creditable 3rd equal, with no fewer than 17 girls having played in the five 8 a side matches. The U13 B boys have lived up to expectations, and are vying for top spot with two matches to play in the DFCA BYCL Indoor League as this is written. The U15 ’Flames’ Girls In their first venture indoors, were just pipped on bonus points for top spot in a very competitive league involving Bath, Cam and Dumbleton. Indoor Nets have finished, and good attendances across the age groups have been reported at each venue. Hopefully April has emerged clear and bright, and outdoor training (U15 Boys/U17 Mixed every Monday 6.30 – 7.30, and the remaining Youth Groups Fridays 6.30 – 7.30) will have commenced. The ground will also soon (hopefully) be busy with matches, as youth games and senior friendlies start in mid-April. Then on Thursday 28th April, the club host a Special Educational Needs Schools Cricket Day, part of the aim being to encourage some of the students to look to join the Frenchay Falcons Ability Cricket Groups (meeting each Monday 11 – 16 @ 6.15 – 7.15, and 16+ @ 7.15 – 8.15). Also launched recently is the new Frenchay Cricket Club website www.frenchaycc.com where you will find news, fixtures, results and lots more. successfully passed the critical first stage. The ground has been dogged by underlying Frenchay clay and matches have frequently had to be cancelled when other grounds are fit. We can now fund a technical assessment by engineering consultants to produce a scheme to improve drainage with detailed costings, and hopefully funding to cover implementation. Indoor nets have started for many of the senior and youth groups and details can be found on the website. In addition, four sides are continuing their indoor league matches, with lots of excitement and progress. Plans are also in place for the coaches to continue in the schools with cricket in the summer and the young people will be seen on Frenchay Common (back to the roots of the club) in April through to June. We have highlighted the important contribution this makes in this extract from the recent Frenchay School Ofsted Report. The club was also pleased to host ‘An Evening with the Champions’ in February when Gloucestershire head coach, Richard Dawson and David Payne brought the Royal London One Day Cup, and kindly did a question and answer session, followed by Food and a Kwik Cricket Quiz. Nearly 70 members of varying ages had the chance of seeing the cup, taking a quick ‘selfie’ and lots of fun. The nights are now drawing out, so the new outdoor season edges closer. Hopefully, the rain will have abated, and some drier weather will have helped the ground to become less soggy. February will see the various youth teams starting indoor net practice, and several continuing in their respective indoor league competitions. It will also be the time when four of our older girls, Emily Wilkins, Emily Locke, Naima Milhofer and Nat Wraith, jet off to Sri Lanka in a party of young Gloucestershire players for a cricketing (and life) experience among the cricket mad communities of that Island. We are looking to build on our National ChanceToShine Project of the Year Award 2015 in the local schools, but our funding from Gloucestershire has been reduced for 2016. In a sense, we are victims of our own success, because Gloucestershire (understandably) want to encourage more clubs to follow our example. They have therefore encouraged clubs across the county to get involved in this incredibly fruitful scheme, which has therefore reduced our slice of the cake. This will mean that we will have to reduce the amount of work we can do in our five link Schools (Frenchay C of E, Bromley Heath Juniors, St Augustine’s RC, Winterbourne International (Girls) and Culverhill SEN Yate), unless we can secure some sponsorship, maybe from a local company. If your son or daughter has enjoyed cricket on the common, or you have seen the children having fun, and would like to support this, please get in touch with Jim Donaldson, the club’s ChanceToShine Manager (bycl@blueyonder.co.uk or 07771502274), and he will be pleased to have a chat with you about the scheme. We might have had a fairly dry summer, but the weather has made up for it during November and December, and if the ground needed water, it has certainly has got it now! We have more achievements to record for our young players. U15’s Naima Milhofer and Natasha Wraith have been invited to continue with the Gloucestershire Emerging Players Programme (EPP), which is at the top end of the County Performance Programme. It is excellent that Maisie Hunkin has been invited onto the new Sub EPP Programme. The autumn series of indoor leagues has now finished, and the seniors didn’t do so well this year, not qualifying for the play offs. However, two young teams have been competing weekly in the indoor BYCL DFCA U12 League at the County Ground. The younger side, Frenchay B’s, have performed creditably in their very first experience of indoor cricket, and this should stand them in good stead for the next series of matches beginning at the same venue in January. However, pride of place must go to the U12 Frenchay A side, who won the league, losing just one match in the process. Harvey Marshall’s team (pictured) received the trophy from Chris Dent, Gloucestershire opening batsman. They are also looking forward to defending their title in the new year. The U15 Girls are involved in a new indoor league based in Whitchurch, and a very young side completed their first round of matches recently against teams from Bath, Cam and Dumbleton. Further rounds of matches take place into the new year on Saturdays. The U11/12 girls also embark on the new adventure of indoor cricket, playing sides from Bristol Phoenix, Cam, Charlton Kings, Dumbleton and Frampton/Frocester, at Castle School Thornbury on Sunday afternoons from mid-January through February. It may be ‘out of season', but there is still lots going on which definitely keeps us busy twelve months of the year! Pride of place was the announcement at the annual national ChanceToShine Awards ceremony in London, where Frenchay was named, Project of the Year. This was for our work with the primary schools (Frenchay C of E, Bromley Heath Juniors and St Augustine’s Downend), with the girls at Winterbourne International Academy and with the students at Culverhill Special Educational Needs School, Yate. Our work coaching cricket in the local schools has been central to the continuing development of the girls groups at the club, with 63 girls registered last year from U7 through to U17’s, and with the continuing progress of the Frenchay Falcons Ability Cricket Groups. We are now working on the programme involving the schools for 2016. Pictured are Jim Donaldson, the Club’s ChanceToShine Project Manager, receiving the Award from England Women’s Internationals Tammy Beaumont (left) and Kate Cross. A considerable number of our young players are also making their mark at a higher level, with sixteen invited to attend the Gloucestershire Winter Training programmes in the new year. Congratulations go to Finlay Mills, Lewis Moss, Luke Wilcox (U10 District), Izzy Patel, Evie Patterson (U11 County), Joe Moss, Sonny Reynolds (U12 District), Molly Bliss, Lily Knox, Amy Patterson (U13 County), Katie Padfield (U13 Development), Ellen Harris, Natasha Wraith, Naima Milhofer (U15 County), Emily Locke and Emily Wilkins (U17 County), with another two girls trialling later. Lots and lots of hard work to come yet! The club, with very encouraging support from the wider community, has now made an application to Sport England to improve the ground drainage. The underlying ‘Frenchay clay’ often causes waterlogging in times of poorer weather, and we await the outcome. Contact: Sally Donaldson at bycl@blueyonder.co.uk or visit our website. A record season! The first in living memory when every 1st Xl match was played and none were cancelled or abandoned through rain. The 18 match schedule runs over consecutive Saturdays from May to August, plus two pre-season matches in April. A phenomenal season for matches, is the only way to describe the experience. On the field, the 1st Xl won 9 and lost 9 in the new experience of playing some well-matched teams from Gloucestershire and Wiltshire, including having some really nail biting finishes. The 2nd Xl also had a ‘won 8, lost 8’ record in their travels into Gloucestershire, but did lose 2 matches to the weather. The 3rd Xl blooded lots of young players and finished in a credible position in their league. 2016 sees the restructuring of the senior leagues to reduce travel distances. The 1st Xl come back to the Bristol area in the third tier of the West of England Premier League, while the 2nd Xl return to the Bristol and District League, with the 3rd’s continuing in the extended Bristol and District League. The ground will now be put to bed for the winter, but lots of cricket still goes on, with the seniors, boys, and girls entering teams in indoor leagues. We also intend to build on the series of Women’s Taster sessions held in August at the Club. Please get in touch if the idea of playing (starter) women’s cricket appeals to you. Another cricket season is gradually drawing towards it conclusion. Where has the time gone? But generally the weather has been kind, and (as at early August), all fourteen Saturday league matches were played, which is phenomenal. On the field, the 1st Xl continue their mixed season, the 2nds are challenging towards the top of the table, and the 3rds and Sunday teams have recorded mixed fortunes. The U11 Girls continued on their learning curve with an appearance in front of 3,000 people at the County Ground during the interval of the Gloucestershire v Somerset match. The girls (and families) loved the experience, and lost narrowly in the final of the new ECB Gilbert Cup competition. Looking towards next season, a considerable number of our young players have been nominated for performance trials with Gloucestershire at various age groups, and we look forward to hearing about their progress. In another accolade for our youngsters, Emily Wilkins, Naima Milhofer and Natasha Wraith have all been invited to tour Sri Lanka early in 2016 with a select party of Gloucestershire women and girls. It will be a cricketing experience of a lifetime. Great progress also for the Frenchay Falcons Ability Cricket groups, with players representing Gloucestershire, who had an inaugural match with Frocester. Richard Hill, ECB Disability Officer was in attendance. June was really busy at the Cricket Club, with the regular league fixtures supplemented as the club hosted 19 mixed teams, closely followed by 12 girls teams from the primary schools in the wider area, in Kwik cricket tournaments. These were then followed by competitions involving Years 7 & 8, and Years 9 & 10 girls from the South Gloucestershire and Bristol senior schools. The Gloucestershire Cricket Board organise these, and it is a delight to see the ground regularly filled with young people from the wider community. Additionally, the Bob Stone Ground was pleased to welcome former UK Champion and World No 4 Greg Rusedski on 14th June, when he formally opened the new courts complex for the Downend and Frenchay Tennis Club. The Courts are increasingly busy with coaching and matches on a daily basis. The season has gone reasonably well for the senior teams, with both the 1st’s and 2nd’s sharing mixed fortunes in their new ventures into the depths of Gloucestershire and Wiltshire. The 3rd’s and the Sunday Xl have had challenging times more locally, and generally the youth teams have fared similarly. However, the U11 ‘A’ boys are progressing well at their age group, and the U11 girls were crowned Gloucestershire champions early in the month in the Lady Taverners national nompetition at Cam. The latter is a particular reflection of the success of the Frenchay ChanceToShine cricket coaching programme in local primary Schools, as the squad involved nine girls directly from those activities, including Erin, Summer and Molly from Frenchay School. The Team will now play at the ECB South and West Regional Finals, which will be held at Frenchay on Monday 27th July. Fantastic, girls! A reward for a lot of enthusiastic, hard work. Well done! As often happens, the weather changed once the Senior League season started in May, and the wind was so strong it turned one of the heavy sightscreens over, partly blocking the access drive to the clubhouse! The new, smart wicket covers have arrived, thanks to a grant from the ECB Cricket Trust and support from KMC Mortgage Solutions, plus a new scoreboard for the Top Pitch to go with the recently opened new scorebox, supported by a South Gloucestershire Council Community Grant. On the field, the 1st Xl have started with mixed fortunes, as have the 2nds on their travels into previously untried areas of Gloucestershire. The 3rds have had a promising start, but the 4th’s have suffered from early season availability issues. The youth teams have all be busy and Friday ‘Youth Training’ evenings at the club have been ‘buzzing’. These have been assisted by our coaching in the local schools, with more children from Frenchay School taking up cricket, which is fantastic. 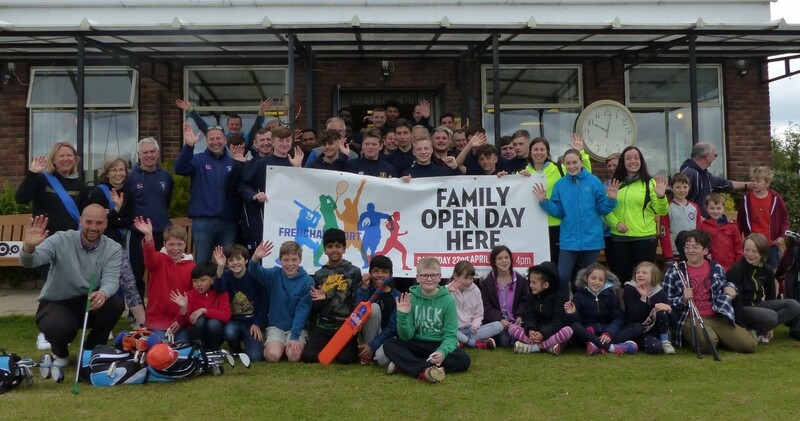 Frenchay Falcons, in conjunction with the Gloucestershire Cricket Board, hosted a busy and lively day for special educational needs schools, when 70 children came along to enjoy cricket. The weather on the day was kind to us, and the event was encompassed with lots of laughter, fun, and learning, with individual achievement at all levels. The tennis courts are now in use, officially opened by Paul Hutchins, former GB Captain on 17th May. Looking ahead, the LTA have arranged for Greg Rusedski, former UK No 1 and No 4 in the world rankings, to visit Downend and Frenchay Tennis Club’s new HQ on Sunday morning 14th June, for another formal ceremony. It is an impressive new facility and we are looking forward to many years of cricket and tennis at the Bob Stone Ground. Another season running, and hopefully the weather is staying bright and dry, with lots of matches played. Visit our website and click on ‘Matches’, then ‘Fixtures’ to find out who is playing, where and when, from the Under 11’s through to the 1st Xl. The results can be found via the same source, just click on ‘Results’ rather than ‘Fixtures’. The Club is extremely grateful to the English Cricket Board and the Gloucestershire Cricket Board for their support in securing an ‘ECB Small Grant’ exceeding £3500 to purchase a new set of ‘Mobile Wicket Covers’. These three lightweight structures are used to protect the playing wicket from the rain. Additionally we are also very grateful to Nigel Croucher of KMC Mortgage Solutions for sponsoring the new covers. These are now in use protecting pitches on the Main Square. The Top Square has also had something of a makeover with both the Southern Brooks and The Chase area forums of South Gloucestershire Council supporting our Community Grant applications. Firstly to help refurbish the existing, ageing set of mobile wicket covers, which have now been transferred to protect wickets on the Top Square. Secondly, the new scorebox/store is now in place, having been kept in store by our suppliers until the new site was available. Downend and Frenchay Tennis Club expect to formally open the new Floodlight Tennis Courts in mid-May, and we look forward to a long and mutually beneficial relationship. Thank you to our local Councillors (Frenchay/Stoke Park, Winterbourne, and Downend/Bromley Heath) for their continuing support. The overall result is excellent, with more people playing more cricket. While writing this, we are hoping for a very dry (and windy) March and early April, because the Cricket Ground is still very damp following the autumn rain and winter ‘freezes’. The four new Tennis Courts are nearing completion, and there is a considerable amount of reinstatement now required to areas of the outfields, before the start of the cricket season after Easter. All of the Senior and Youth Squads have been busy at various locations with pre-season training, and four Adult Members have taken the ECB Coach Education Level Two Course over the winter, to further strengthen the Club’s coaching base. Several older Youth Players are also set to take their ‘ECB Coach Support Worker’ badge in mid-April. The Club is also delighted to have agreed to run ten weeks of cricket coaching for the older Classes at Frenchay C of E School starting after Easter, so look out for Tyrone and the Children (and Teachers) on The Common on a Thursday afternoon. The new season beckons – hoping for a long dry summer!